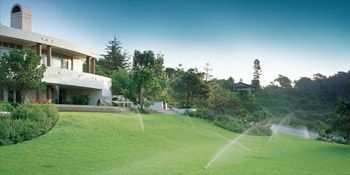 Simmons Irrigation Supply carries a full line of irrigation supplies for the residential and commercial contractor, as well as, offers in-house design services by Irrigation Association Certified Irrigation Designers. Simmons sells major irrigation manufacturers' components and offers jobsite delivery services that allow our contractors to remain efficient through all phases of construction. 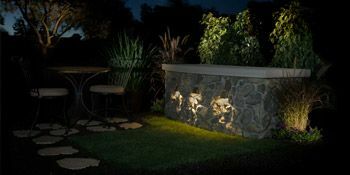 Landscape Lighting has become an integral part of landscape construction. Simmons offers a full line of lighting components at all branch locations. From architectural grade brass fixtures, to basic powder coated finishes, as well as, many different lamp configurations, Simmons has access to the industry’s leading Landscape Lighting manufacturers. The desire for people to expand their homes outward has led to a demand for more useful and comfortable outdoor living spaces. Simmons has partnered with some of the best manufacturers to help offer our customers superior outdoor living products. Photo courtesy of Allan Block. Distributes a full line of irrigation, drainage, and low-voltage lighting products from our 10 locations in both Carolinas and Georgia. These products supply the irrigation needs of contractors, golf courses, and municipalities throughout South Carolina, North Carolina, and Georgia.